When should you use Resident Touch? We're so glad you asked! 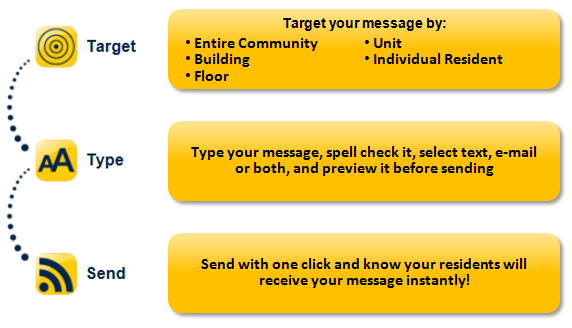 Use Resident Touch anytime you have a message to communicate to your residents, whether individually or as groups. As you probably know, effective communication between managers and residents correlates directly with the likelihood of residents to renew their leases, which goes straight to your bottom line! Text message reminders have helped hospitals reduce missed appointments by 50%, so they can help you collect your rents faster too! Prospect Touch helps you quickly fill vacancies using mobile marketing. 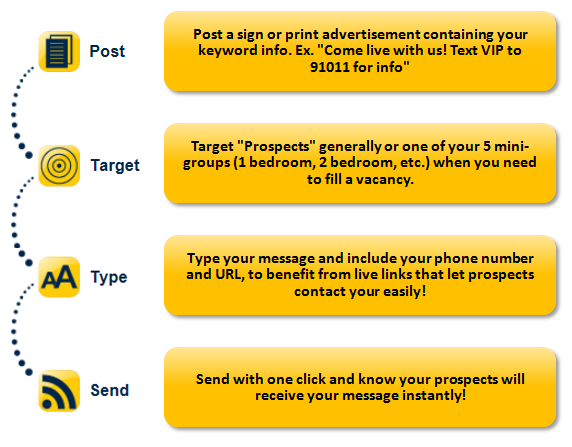 You simply post a sign or print advertisement that contains the short code 91011 and your unique keyword. People who see this call to action and are interested in learning more about your community will text in to receive more information. You decide what message you want them to receive, from specials to rental rates or move-in dates. We have 3 1-bedrm units available now for $995/mo and are offering 2 wks free rent if you sign by Friday. First come, first serve!